Sunday we’ll be pouring two fantastic whites wines that have come to us at exceptional prices. Both have some age on them and are fully developed. You could have cellared them yourself for six years but you don’t have to. Both have very limited availability. Both are marked down 35% to 50%. Think there is something wrong and they can’t be any good. Come try them. Portugal, best known for its Port wines, also makes a wide variety of other wines ranging from the fresh and crisp to the rich and robust. This Saturday will be pouring just a slice of the wines from the country starting with Vinho Verde in the far north to the steep slopes of the Douro valley and on to newer Alentejo region further south. Come have a taste and see where your tastes land. A blend of local grape varieties native to the far north of the country, the wine has a light spritz a nice floral aroma along with a touch of herbs and citrus. The wine is a big hit in summer but can be very enjoyable all year round. Herdade do Esporão is one of the premier wineries of the Alentejo region. Their Verdelho (the same grape as the Spanish Verdejo) has vibrant aroma with tropical fruit and limey citric notes. The palate is fresh and minerally, with a long and persistent finish. Esporão’s easy drinking red is made of a blend of three indigenous varietals. It has youthful fruit aromatics and light floral notes. The Douro region is best known for port wine, but serious maker produce some fantastic dry red wines as well. Domingos Alves de Sousa produces his wines, according to a family tradition begun by his grandfather, which is today also taken up by his children. Domingos was voted “Producer of the Year”, by the Portuguese Wine Magazine Revista de Vinhos in 1999 and 2007. He is the only person to have won this award twice. Tinta Cão has been grown primarily in the Douro since the sixteenth century. The vine produces very low yields which has led it close to extinction despite the high quality of wine that it can produce. Sousa’s is a wild, untamed wine from a traditional old Douro Valley variety with plentiful fruit, firm crunchy tannins, leather and spice complexity, meaty fruit and superb freshness. Today we get it at a bit of a deal. Tinta Amarela, Tinta Roriz, Tinta Barroca , Tinto Cão. Quinta dos Murças, located not far from the town of Régua, dates as far back as 1714, It benefits from a unique landscape of steep slopes, terraces, vertically-trained vines, streams, vineyards and olive groves, This Tawny is fermented in the traditional granite legates with foot treading and is aged in used oak pipes of 700 liters for an average period of 10 years. It is complex and nutty with notes of fig, hazelnut and vanilla. We have a few things lined up on this lovely fall weekend. Today at 2 we’ll be pouring some joyous (and affordable) French wine from the sprawling regions of France. Sunday we’ll be saying farewell to summer with a Provencal rosé from Routas, and hello to fall with a new Nero d’Avola / Merlot blend from Tasari. Stop in and celebrate the seasonal shift. This Saturday we’ve collected a group of French wines that put a smile on our face and we think will put a smile on yours. Stop by and try these great wines from Alsace, the Loire, Bordeaux, Languedoc, and Madiran. It’s a tour in a glass. For five generations the Caillé family has been making Muscadet in Monnières. The wine ages “Sur lie” (on its sediment) for several months which adds body and mouthfeel. The La Fay is a fuller Muscadet, dry and focused with notes of white flowers. It’s the perfect wine for shellfish of all sorts. Michel Fonné studied winemaking in Dijon and Champagne where he learnt about sparkling wines. IN 1089 he returned to Alsace manage the Barthe René estate for his retiring uncle. In 1997 he took over the vineyards of his father, and merged them with those of Barth René for a total of 12 hectares some of which are designated Grand Cru. About 10% of the plantings are dedicated to his Crémant d`Alsace, an above average sparkler with beautiful white peach tones, mineral nuance and hints of citrus skin that resolves into a long, dry finish. The Domaine Galtier is a typical Languedoc farm (mas) surrounded by garrigue (scrubland) with its square tower and its bread oven built in the middle of the 17th century. The vineyard covers 25 hectares located near the small village of Murviel lès Béziers. The owners, Lise and Jean Carbonne are both from wine-growing families back two generations (her father and his mother). The Garrica is a light and herby Languedoc red — Great with food or just sipping by itself. François Decombe’s uncle owned a tiny vineyard and a few cows producing milk. After two years working with his uncle François rented his own vineyard and became a self taught winemaker. The vineyards are Certified Organic and farmed bio-dynamically. François barely touches his wines, he focuses on a hard work in the vineyard and an impeccable hygiene in the cellar, then he only has to listen to them singing and bottle them when he thinks they are ready. François smiles saying that the vines talk to him, thank him and give him beautiful fruit, every year. The wine has very enticing nose intermixing ripe blackcurrant and pleasant smoky mineral undertones. When she took over her family’s vineyards in 1993, Christine Dupuy was the youngest winemaker in Madiran(and a girl to boot). Her Madiran is produced from 10 acres of clay loam soil Gravettes. The wine ages 18 months before being bottled. It has a complex nose of red fruits and spices, fat, round tannins and a full finish. This local Rhône style white blend is dry full-bodied wine with perfumed aromas of spiced herbal tea, spring blossoms, Asian pears, greengages (European plums), and honeysuckle. 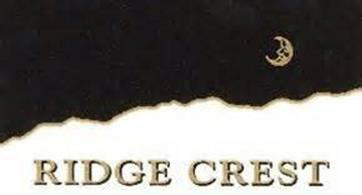 Ridge Crest is the second label for Claar Cellars. Aged 18 months in oak, this wine has a dark cherry, plum fruit aroma with hints of tobacco and cedar. On the palate the wine is soft with a dark fruit explosion that expresses the cherry and slight currant berry flavors. The tannins are soft and add structure to the lengthy and jammy fruit finish. Outside of Turin in the very North of Piedmont sits the Val de Susa. In this long high altitude valley grow some traditional grapes that you don’t see elsewhere. Val de Susa is a tiny, tiny, tiny DOC with only 11 hectares under vine split between 11 wineries. To say that these wines are of limited production is an understatement. The oldest winery in the region is Casa Ronsil. The property has been in the Ronsil Family since 1250. Today the winery is run by Pierino Ronsil with his son-in-law Franck Thollet. They focus on traditional varietals Baratuciat, Serella, Becuet and Avana with vines that range from 50 to 90 years old. The vineyards are tended to organically with no sulfur used during vinification, and very little at bottling. All the wines are fermented in stainless steel and aged in large neutral barrels so you can experience the grapes. Come by on Saturday as we taste these rare and delicious wines. Crisp lemony mouth feel, mountain flowers delicate but long finish. The bad child has flavors of bright and snappy blueberries, and darker fruit. The Camilo, named after Pierino ‘s father is from 70 year old vines in the La Voùte vineyard. The wine is full of dark earthy plum fruit and Christmas cookie spices. The Saint Bartolommeo comes from their oldest vineyards of 90 year old vines. It is fuller and more intense than its younger brothers. The Neretta Cuneese makes all the difference. A fascinating old world wine. A beautiful pink color, the Pasito is full on the mouth and persistent with intense aromatics qualities obtained from the red grapes (usually Passiti is made with white grapes). The harvest starts in October and the grapes are dried during the winter before being pressed slowly. It is aged in oak barriques for 12 months. This Sunday we will be tasting two lovely wine from wine importer (and now blender) Kermit Lynch. Kermit Lynch was born and raised in California. From his youth he remembers that his father and uncle worked for a winery, but he has no memory of anyone in his family drinking wine. The Lynch family was rich in preachers, too, but at communion they served Welch’s grape juice, even though, as Kermit points out, Jesus turned water into wine, not grape juice. In 1972 he opened a retail wine shop and later began importing and distributing nationally. In 2000 he was named Wine Professional of the Year by the James Beard Foundation, in 1998 the French government presented him with the Ordre de Mérite Agricole award, and in 2005 named him Chevalier de la Légion d’Honneur. In 1988 he planted his little terraced hillside near Bandol with Mourvèdre vines. The juice now goes into Domaine Tempier’s famous La Migoua cuvée. In 1998 he purchased the historic Domaine Les Pallières in Gigondas in partnership with his friends the Bruniers of Vieux Télégraphe. Made by Domaine Durban and blended by Kermit the Blanc is full and tasty and non traditional. Round-bodied texture, yet tart, stony crispness and a knockout aroma of pear, sun-baked apples, and spicy hints of anise.-Limited production. With this VDP, Kermit steps out of his importer role and takes on blending his own cuvee. The wine is made by Domaine de Durban, harvested by hand and ferment by carbonic maceration, then aged for 8 months before being bottled unfiltered. In the blending Kermit goes wild breaking all the rules, but comes up with a tasty wine. As much as we love the complexity and tradition of the wines from France and Italy, it is nice to find tasty wine a little closer to home. This Saturday we’ll be pouring wines from four Washington wine makers who don’t get as much attention as they deserve. These winers are winners. Stop in and get a taste of local flavor. Upland vineyard in Snipes Mountain is the reclaimed site of Washington’s first winery east of the cascades (Bridgeman). Their food-friendly Sauvignon Blanc is barrel fermented in neutral oak barrels and aged sur lees for 7 months. The wine is lush up front, loaded with tropical fruit, hints of citrus, lemon grass and fig that is balanced around bright acidity and a crisp dry finish. A relatively new kids on the block, Sun River Vintners in Kennewick is making some interesting and reasonably priced wines like this Columbia Valley Chenin. Chenin Blanc usually goes one way or another – sweet or dry – and this Chenin took the dry route which meant it would not be just a summer wine. In fact, this lemon, citrus inspired flavor profile is the perfect partner for the sea. A smooth and supple Bordeaux blend put together from some prestigious vineyard sources (Conner Lee, Klipsun, Chandler Reach, & Clifton Hills). Deep, dark, and luscious with black cherry, clove and peppery pizzazz! The aroma of this blend entices the nose, deep and unctuous on the palate with a lifting finish that demands another glass. Planted in 1973 on the south slopes of Snipes Mountain by Alfred Newhouse, the fruit from this Cabernet Sauvignon block has the refined but definite tannins. The wine was aged in new American oak for 22 months. The Cabernet Sauvignon shows dried berry fruits, herbal spice and chocolate caramel. Its refined tannins are backed by well integrated oak flavors that build around its depth, concentration and full bodied finish. Only 96 cases were produced and only a few of those are left before it rolls into 2010. New Artwork Hanging In The Shop. Observational studies of nature and landscapes are central to my practice. Since we moved to Phantom Lake in Bellevue 11 years ago, I have painted my wetlands surroundings, especially the birds. It’s a privilege to live in the wetlands. 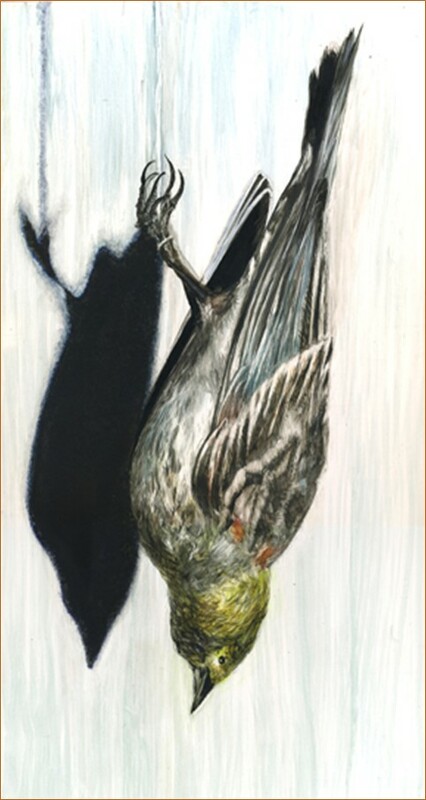 Smaller birds fall prey to other predators or are misled by window reflections and become the subjects of my drawings or paintings. Most recently I began to study the winged insects, too. They are beautiful and fascinating creatures with the benefit of having 2 perspectives-their view from the ground and their view while aloft. My medium is usually watercolor and acrylic ink although I paint more like an oil painter than a watercolorist. For this series, I collected unfinished tile, porcelain and concrete tiles from a salvage yard in Seattle to use for my insect paintings while others are painted on clayboard. This Sunday we will be tasting two lovely Washington wines. A moderately priced Walla Walla rosé and Columbia Valley Tempranillo. The Hence cellars winery is located on the south side of Walla Walla on shared grounds with the Orchards personal residence. The estate vineyards provide the landscape between the two. Current production sits plus or minus 1,200 cases a year, with 90% of the fruit grown and managed Henderson, and my father Willis “Papa” Orchard. The focus is on quality control, from the grape to the “Juice”. We take the fruit and extracts a concentrated delightful blend of fruit with 100% new oak, which is a mix of French, American, and a “sprinkle” of Hungarian Oak. The process is not one of speed, considering the wines avg. 24-28 months in barrel, which is critical in order to get that balance of fruit and barrel flavors. Another wheat farmer turned wine maker, Hence Cellars producers small lot estate wine from their Wall Walla properties. This on has a little bit of the whole vineyard in it. It is bold and fruity, but has enough acid to hold it all togeher. Kana is a native word for the spirit or the fire within a mountain, in reference to the perceived supernatural power of volcanic activity. The Yakima and Columbia Valleys are awash with volcanic soil influences, providing terroir from the millennia of “Kana” escaping from nearby volcanic mountains, to lay resting as soil for our world-class vineyards. Sourced from Stone Tree (60%) and Elephant Mountain (40%) Vineyards and aged 3 years in French and American oak, 1/3 new, Kana’s Tempranillo shows beautifully intense aromatics and flavors of black cherry, raspberry and caramel almonds wrapped with chalky tannins and finishes long with a compact fruit finish and balanced acids. We start tasting at 11am until the bottles run out – stop by early to make sure you get to taste these two lovelies.